HUGE. The flowers on this Camellia are HUGE. Semi-double pink flowers are up to 5″ across. Don’t diss pink. 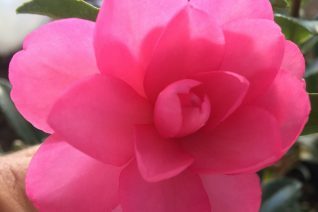 No other flower does pink quite like Camellias. 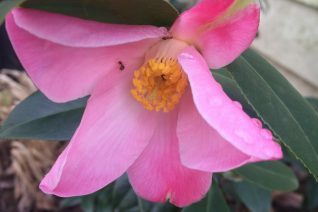 ‘Brigadoon’ is a spectacular hybrid that blooms for the last month of winter and the first two months of spring. Clean, glossy, deep green foliage is handsome at all times on a dense growing shrub to 8′ x 4′ in 6 years. Grows about 1′ per year. Full sun to part shade to quite a bit of overhead shade so long as it isn’t oppressive. Huge amounts of buds open to these voluptuous blossom. Excellent cold hardiness enduring temperatures just right below 0ºF with no damage. Excellent resistance to subfreezing gorge wind- it would be a great windbreak to stop that arctic blast. Flowers fall completely off of the shrub never clinging and turning brown. Easy, long lived, climate adapted shrub. 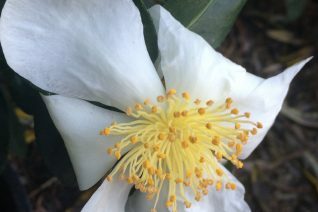 Extraordinary Camellia hybrid that combines all the great attributes of a Camellia with larger, more dramatic flowers and more of them, and excellent cold hardiness as well as garden adaptation. Large growing glossy evergreen shrub with fetching deep green leaves. 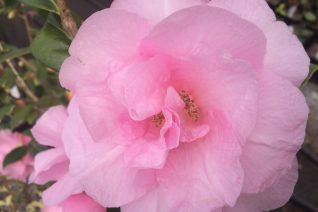 In late January to early March- and often longer than that depending on the weather 5″ flat fully formal double clear pink flowers are stunning. You really have to see them up close to get a handle on the size and perfection of each flower. Upright growing shrub to 9′ tall by 7′ wide in 10 years. Full sun to quite a bit of shade in well drained soil that retains moisture. Light consistent summer moisture aids establishment and also increases the amount of flowers the following season. Established plants can endure quite a bit of drought. Exceptional cold hardiness. Flowers shed cleanly- they shatter without clinging and discoloring. 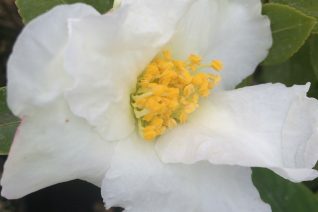 Unusual, profuse and a great color for a Camellia, ‘Buttermint’ produces fully double, but small flowers that deck all the stems for months in mid-winter to spring. Moderately fast growing evergreen shrub to 6′ tall and 4′ wide in full sun- but not reflected heat, part shade to quite a bit of shade. Regular, consistent summer irrigation for the first few years to establish. Older plants can get by without summer irrigation- but bud set and flowering is improved with such. 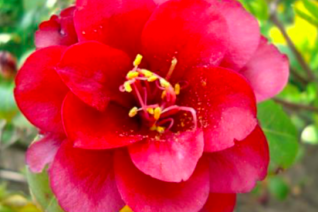 The flower color is aptly described by its name. Pale yellow to buff to off white as they unfurl. 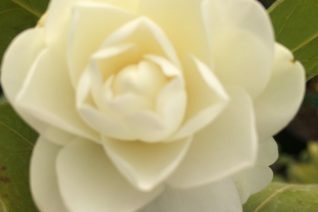 Flowers do not turn brown and cling when spent instead they drop cleanly so in bloom there is a uniform fresh appearance. Long lived shrub that grows about 1′ a year when young. Give it room in time. Exquisite winter blooming companion for Hellebores, Grevilleas, Iris lazica, Iris unguicularis. Small glossy deep green foliage is fetching year round. Sets many, many flower buds in autumn. 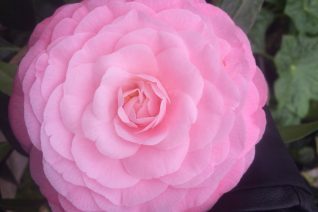 Big graceful open growing Camellia with exceptional open single flowers. 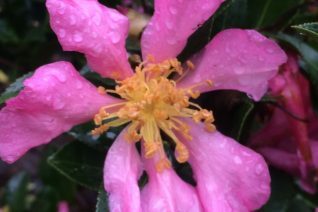 The long petals are fluted and arc outwards. The effect is very much like an open tulip. Soft pink flowers on a heavy blooming shrub to 12′ tall and 9′ wide. Less dense than other cultivars. Density increases in full sun. Handsome glossy deep green foliage. Blooms February to April in an average year. Grows 1′- 2′ per year. Full sun to full shade in rich, well drained soil with regular irrigation to establish. 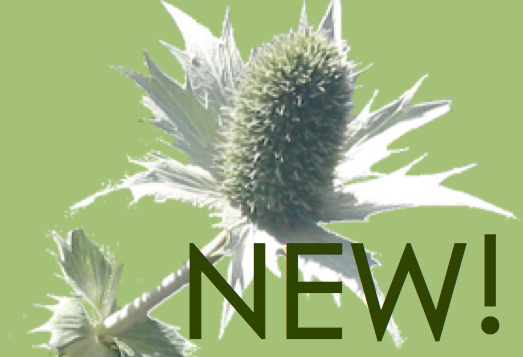 Older plants take summer drought in stride. 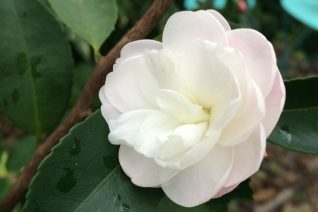 Rare Camellia that is worth seeking out for its fascinating, elegant flower form.